P.E.P. is an award winning after school program. We are a non-profit organization running a variety of sports and enrichment classes. Thank you for your interest in this year's after school activities. We are excited to offer activities on Mondays, Tuesday, Wednesdays, and Thursdays. Late buses will be available two days each week (days to be determined), for students that are provided transportation by LAUSD. Tumbleweed Parent-Sponsored Buses are available Monday through Thursday for students who have enrolled in the program. In order to ensure the safety of all students... please pick up students in the PE area. Please drive up the west driveway and park near the bus area (by the transportation office). After child is picked up, please proceed up the west driveway to Sunset Blvd. Register now for the 8th Grade Disneyland Trip! If you would like to make a donation to P.E.P., please choose the donate button. We appreciate your support of our enrichment program! Check out the sports and activities we have to offer below. Then click Register. Pre-registration for tryouts is required. Click here. Please wait until the team is posted before completing registration. Students must attend both days of tryouts. Games start beginning of March, with the possibility of playoffs in May. Prior experience is required. Transportation is NOT provided to games. Boys Lacrosse competes in the private middle school DELPHIC LEAGUE. Competitive schedule will be emailed to team member families after the AD meeting on FEB 25th. For detailed audition and rehearsal information, click here. Join an amazing group of coaches, as they share their knowledge and expertise in track and field. This is a perfect opportunity to have a great time and master the basic skills of some of track and field’s most exciting events – long jump, high jump, hurdles, shot put, relays, and sprints!!! The track team will compete in several meets with other schools in the Delphic League. Sign up to learn the techniques and skills that will make you a pro! Students will develop a powerful serve, backhand, forehand and overhead smash. Students will improve their game through group lessons. If you have any interest in tennis, make sure to sign up early. This class is limited to 12 students. Don’t be sad the competitive wrestling season is over… Take advantage of this opportunity to work with Revere’s coaches and refine your techniques so you will be ahead of the game. Stay conditioned and improve your wrestling skills. 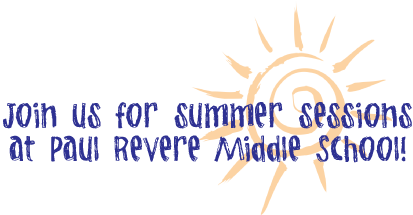 Join Revere’s successful soccer program, led by local soccer professionals and coaches. This is a fantastic opportunity to train with a champion and improve your skills and technique. If soccer is your passion, your participation in this academy will do wonders for your game! Students will participate in various drills and scrimmages. If you are serious about playing basketball at the high school level, this clinic is for you. This class is designed for intermediate to advanced players only. Students will work with a basketball specialist to improve their game and be better prepared to compete at the high school level. As an outdoor adventurer, not only will you become acquainted with the natural wonders of our planet from the magical oceans to brilliant jungles, but you’ll also be challenged to take positive action as we rethink the way we as humans engage the natural world. All participants will develop their own SURVIVAL KIT throughout the program by earning or creating tools each week related to the topic as we connect ideas to action and YOU to the planet! Are you creative? Artistic? If so, come join other students in a fun after-school watercolor class! Each week, the class will focus on a different theme. Pet portraits in watercolor, big umbrella still life, self-portrait collage with newspaper background and more! Don’t miss out on this class! Students will practice and play in a fun, low stress environment with other students from Revere. IM Volleyball is for all the students that want to improve their skills and have a good time. conversing in a fun and creative setting. Don’t miss this opportunity to be introduced to a foreign language! Do you have an upcoming private school entrance exam or high school math placement test? Ms. Stewart will review Algebra concepts and teach math test taking strategies during this 10 week class. This class will fill up quickly. This class is only for 8 th grade students currently taking Algebra or Geometry. Obstacle courses, gymnastics, ninja skills and more!! Come challenge your physical abilities while building strength, agility, coordination and balance in a fun, outdoor environment. All levels are welcome!!! $90.00 Do you love frisbee? Students will learn the fundamentals of throwing, marking, and playing. Each day you will practice these techniques and learn various strategies during scrimmages. Get a great workout and have fun at the same time!!! In order to ensure the safety of all students... please pick up students in the PE area. Please drive up the west driveway and park near the gym, in the bus area (by the transportation office). After child is picked up, please proceed up the west driveway to Sunset Blvd. Enrollment is on a first come- first serve basis. Register your child early to guarantee a space. Costs include a $25 non-refundable registration fee. All requests for refunds must be submitted prior to the start of the second week of the session. 1) Good citizenship and behavior are expected at all times, especially when dealing with coaches, instructors and volunteers. Poor sportsmanship (by parent or student) will result in immediate student suspension/removal from P.E.P. without refund. 2) Students must maintain a min. 2.0 gpa, with no more than 1 U in work habits and cooperation to participate on a competitive team. 3) PEP has the right to remove students at any time due to safety concerns or behavior issues. 4) Completed forms (registration, financial aid) and payment must be received before student can participate. No exceptions!!! 5) Participants must show up to practices and classes regularly and on time. 6) All Financial Aid requests must be submitted prior to the first day of the session. 7) All requests for refunds must be submitted prior to the start of the second week of the session. 8) Outdoor activities will be cancelled in the event of inclement weather. There are no make up days for missed classes/activities. 9) A non-refundable $25 enrollment fee is included in all registration fees. 10) Enrollment is on a first come- first serve basis. Register your child early to guarantee a space. P.E.P. has no affiliation with Paul Revere Charter M.S. Use of the school premises has been granted pursuant to the provisions of Sections 17400, et seq., of the Education Code of the State of California to Personal Enrichment Program, Inc. (PEP, Inc.) from the Board of Education of the Los Angeles Unified School District. The Board of Education does not sponsor or take responsibility, nor does it necessarily endorse activities, statements, or opinions which may be expressed at this meeting or activity. Go Green Tip: Reduce the use of plastic products. Plastic is not biodegradable, and its degradation leaves harmful byproducts in our ecosystem. P.E.P. is a nonprofit, tax-exempt organization under the provisions of Chapter 501(c)3 of the Internal Revenue Code.